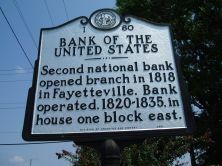 Second national bank opened branch in 1818 in Fayetteville. Bank operated, 1820-35, in house one block east. Congress created the Second Bank of the United States in 1816, granting it a twenty-year charter. Opposition arose almost immediately, increasing with the Panic of 1819. In the landmark 1819 McCulloch v. Maryland decision, the U.S. Supreme Court ruled that states could not restrain the bank’s power. Criticism of federal control increased, culminating in President Andrew Jackson’s 1832 veto of the bill to extend the charter. Differences over the Bank had a major impact on the American political party system. The legislature in North Carolina in 1816 sought one of the Bank branches. The practice was to locate branches in commercial centers; for example, Norfolk, Mobile, Natchez, and Savannah hosted offices. Fayetteville citizens campaigned for a branch, basing their claim on central location, river navigation, and the convergence on roads. At the time the state had only three banks: the Bank of New Bern, the Bank of Cape Fear, and the State Bank. 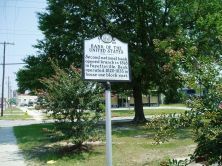 The board of directors of the Bank of the United States selected Fayetteville and the branch opened in January 1818. Former Congressman William B. Grove became the first president and R. W. Latimer the first cashier. The branch faced early challenges. Grove died in March 1818, leading to appointment of John A. Cameron as president. The legislature sought to impose a $5,000 tax on the Bank but the Supreme Court decision ruled the tax to be illegal. Latimer resigned his post in 1820 and was replaced by Charles S. Weast and later by John W. Sandford. In 1820 the branch took as its office a large Federal style house built a few years earlier by Duncan McLeran, who served on the branch’s board. A vault was installed in the basement and business conducted on the first floor. Fayetteville citizens protested the removal of federal deposits in the Bank of the United States. Operations ceased locally in 1835. The house, purchased in 1838 by cashier Sandford, was the boyhood home of notable American artist Elliott Daingerfield (1859-1932). Since 1941 it has been the headquarters of the Fayetteville Woman’s Club.